For years I have hoped to locate within the family the photos of our immigrant ancestors, Joseph Niehaus and Gertrude Wilmsen Niehaus. A very helpful cousin, GeorgiaLee Kirn Taylor, was generous enough to share these with me. I am very glad to see them. Joseph's age in this photo is estimated to be 67 to 70. He is living in his home on South West Street in Indianapolis, Indiana, with the Ralph and Rosa (Niehaus) Lark family. His wife was deceased at this time. For more information on this family, click on the Family Line page. Niehaus Sisters - Daughters of Joseph and Gertrude. Rosa Niehaus Lark, Anna Niehaus Donahue, Wilhelmina "Minnie" Niehaus Kirn, Josephione "Feenie" Niehaus Stull and Clara Niehaus Sapp. This photo is estimated to be taken in the mid-1940s. The Niehaus clan remained close throughout their lives. 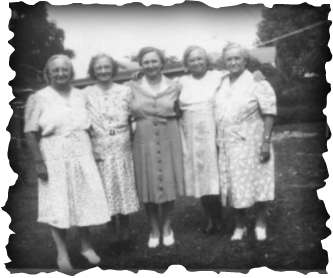 These ladies had seven brothers and sisters, at one time all living in Indianapolis, Indiana. The estimate for the date of this photo of Gertrude is 1873, the year she married Joseph in Emsdetten, Germany. 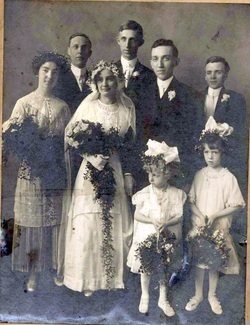 She appears to be wearing a dress that would have been the attire for a bride of that era. 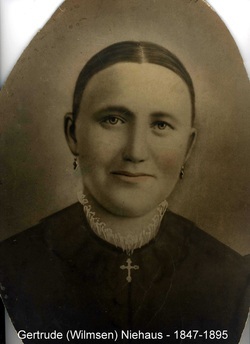 However, this could even be a photo of her after she came to the United States in 1886 as a mother of eight children. Here is a selection of Weber/Kuhn family photos. 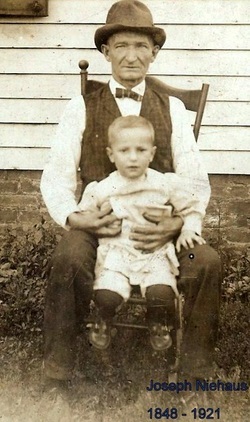 They range from an 1885 photo of Harry Adam Weber to late 1950s family group photos. I have marked each one with the names of people that I can identify. Some group photos are missing a few names. Please let me know if you have further identifications. And especially if I have any errors. It would be so nice to know who everyone in the photos are and how they all relate! bride; Dot Hinz, niece of the bride, Catherine Weber, sister of the groom. Walter Weber, brother of the groom. grandparents. They lived their entire lives in Indianapolis, Indiana. 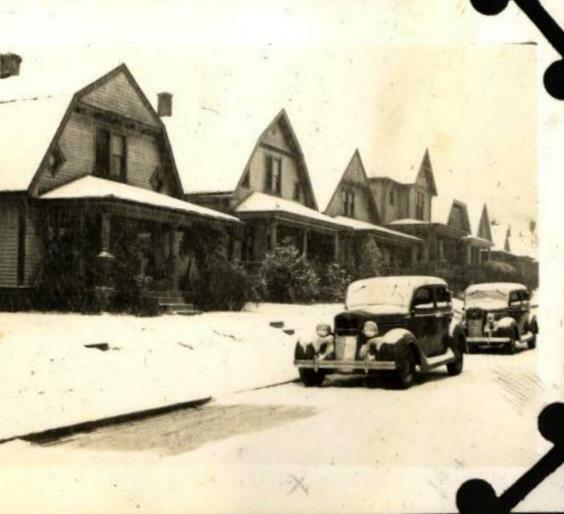 All three family homes below are in Indianapolis, Indiana. The first on left was the home for many years of my Weber great grandparents' family and the far right is where my Weber grandparents raised my mother and her five siblings. 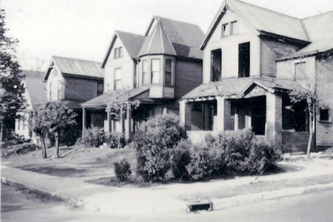 On the left is the Harry and Mary Weber residence at 537 S. Alabama St., Indianapolis, Indiana. In this photo, their home is the second from the right. We're not sure of the year of this photo, but it is obviously taken when the homes were vacant. The search continues for a photo of this home in its active years. The Harry Adam and Mary Anna (Keen) Weber family lived in this home from approximately 1900 to 1942. Of course, there were varying numbers of people occupying the home, ranging from 14 to 5. The children were born there and some of them still lived there when they died. The home was devoured by the development of Eli Lilly Co. a few decades ago. 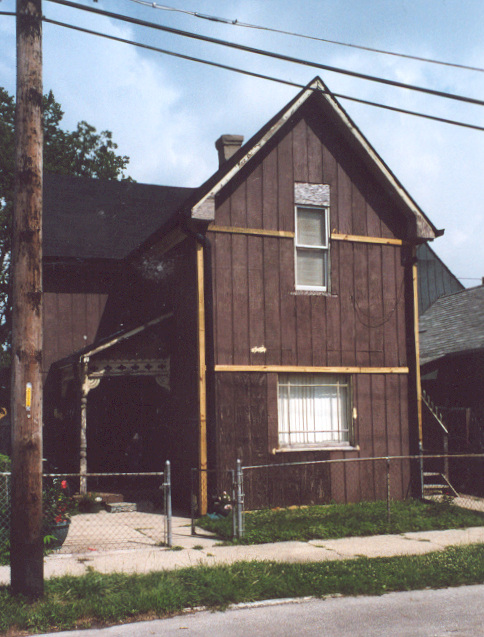 In the middle below is the Niehaus home at 1135 S. West St., Indianapolis, Indiana. Joseph and Gertrude (Wilmsen) Niehaus immigrated from Westphalia, Germany in approximately 1886 and their large family, eventually reaching 11 children, lived in this home beginning in 1889. In 1921, when Joseph died, the family of Ralph and Rosa (Niehaus) Lark remained residents for some years.. At this writing in 2012, the home is still standing along side a few more on West Street that have survived interstates and city redevelopment. Click on the photos to see an enlargement. Indiana Ties website by Nancy Niehaus Hurley is licensed under a Creative Commons Attribution-NonCommercial-ShareAlike 3.0 Unported License.